Ebron caught all three of his targets for 37 yards and a touchdown in Sunday's 42-28 win over the Raiders. Analysis: Ebron's biggest play was a 20-yard score in the third quarter. Fellow tight end Jack Doyle returned from a hip injury and led the team with 70 receiving yards and a touchdown, but Ebron's seven touchdowns through eight games this season suggest he'll still be a major red-zone weapon when the Colts return from their Week 9 bye. Ebron's usage may decrease with Jack Doyle (hip) cleared to return. 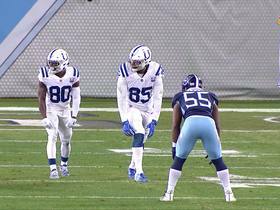 Analysis: During Doyle's five-game absence, Ebron took advantage of a banged-up receiving corps, averaging 10 targets per game and scoring four touchdowns. Ebron's snap count is expected to experience a downturn with Doyle back in the fold, but the fact Andrew Luck is leading the NFL in pass attempts should keep both tight ends viable in the fantasy realm. Ebron caught three of seven targets for 31 yards in Sunday's 37-5 win over Buffalo. Analysis: The good news? 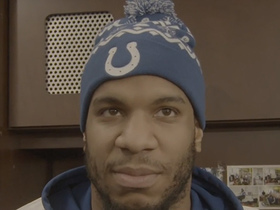 Ebron was far and away the leader in targets, as no other Colt was the intended receiver on more than four of quarterback Andrew Luck's 23 passes. Unfortunately, none of Luck's four touchdown passes were directed at Ebron, as Erik Swoope was the only Indianapolis tight end to find paydirt in this one. 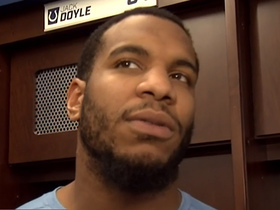 Even with Jack Doyle (hip) sidelined, Ebron's week-to-week workload has varied dramatically. He has six touchdowns in seven games ahead of a Week 8 matchup with the Raiders. 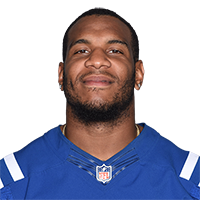 Ebron is expected to pick up another start at tight end Sunday against the Bills with Jack Doyle (hip) ruled out for another game, Kevin Bowen of 1070 The Fan Indianapolis reports. Ebron caught four of seven targets for 71 yards and a touchdown during Sunday's 42-34 loss to the Jets. Ebron (shin/quadriceps/ankle/knee) is active for Sunday's game against the Jets. Ebron (shin/quad/ankle/knee) is listed as questionable for Sunday's game against the Jets after practicing fully Friday. Analysis: Ebron missed practice Wednesday and Thursday, but his return to a full session Friday suggests that he'll be a go this weekend. Confirmation of that will arrive in advance of the first wave of games Sunday, with the Colts kicking off at 1:00 PM ET. Assuming he plays, there's potential for another big volume outing for Ebron in Week 6, with both Jack Doyle (hip) and T.Y. Hilton (hamstring) out again this week. Ebron (shin) suited up for Friday's practice, Andrew Walker of the Colts' official site reports. Analysis: It won't be clear how much Ebron was able to do until after practice, but it's a good sign that he was back in action after sitting out the previous two days. The Colts will reveal Ebron's status for Sunday's game against the Jets at the conclusion of Friday's practice. Ebron (shin/quad/ankle/knee) didn't practice Thursday, Zak Keefer of The Indianapolis Star reports. Ebron was held out of Wednesday's practice and listed with four injuries on the Colts' official report. Ebron brought in nine of 15 targets for 105 yards and two touchdowns in the Colts' 38-24 loss to the Patriots on Thursday. Ebron (knee) doesn't carry a designation on the final injury report for Thursday's game against the Patriots. Ebron (knee) was a full participant at Tuesday's practice for the second straight day. Ebron caught five of 10 targets for 40 yards and a touchdown during Sunday's 37-34 loss to Houston. 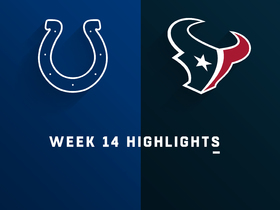 The Colts ruled out Jack Doyle (hip) on Friday, leaving Ebron (shoulder/knee) as the primary tight end for Sunday's contest against the Texans, Andrew Walker of the team's official site reports. Ebron (shoulder/knee) practiced fully Thursday, Andrew Walker of the Colts' official site reports. Analysis: Ebron is thus in line to play Sunday against the Texans. With Jack Doyle still dealing with a hip injury and trending toward Week 4 inactive status, Ebron figures to remain heavily involved in the Colts' passing attack this weekend. In Week 3's 20-16 loss the Eagles, Ebron was targeted a team-high 11 times, en route to hauling in five catches for 33 yards. Ebron (shoulder, knee) was spotted at Thursday's practice, Stephen Holder of The Athletic reports. Analysis: We'll circle back on Ebron's status once his participation level is revealed, but his return to practice bodes well for his chances of suiting up Sunday against the Texans. With Jack Doyle dealing with a hip injury, Ebron should be in line for plenty of tight end snaps in Week 4, health permitting. In last Sunday's 20-16 loss the Eagles, Ebron's team-high 11 targets yielded five catches for 33 yards. Ebron was held out of Wednesday's practice due to shoulder and knee injuries, Kevin Bowen of 1070 The Fan reports. Analysis: With Jack Doyle (hip) unavailable in Sunday's 20-16 loss to the Eagles, Ebron drew a team-high 11 targets on 52 snaps (88 percent). The 25-year-old apparently came out of the game with a couple health issues, but there hasn't been any indication that either is serious. 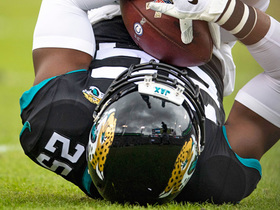 Doyle also missed Wednesday's practice and appears no better than a 50-50 bet to play Week 4 against the Texans. Erik Swoope and Ryan Hewitt round out the Colts' depth at tight end. Ebron had five receptions for 33 yards on 11 targets in Sunday's loss at Philadelphia. Analysis: Ebron saw increased activity with Jack Doyle out with a hip injury as he led the team in targets. He played a season-high 52 snaps on offense and went out on routes on 41 plays, according to Pro Football Focus. Ebron had just 6.6 yards per reception, so he didn't capitalize on the opportunity. However, he could be set for another large role in the offense next week against Houston if Doyle remains out. Ebron's teammate, Jack Doyle (hip), is week-to-week, George Bremer of The Anderson Herald Bulletin reports. 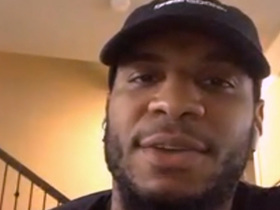 Analysis: Ebron was already on the fantasy radar, even though he was working in a timeshare. 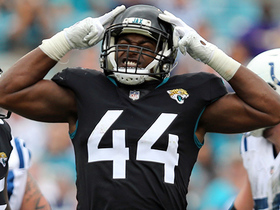 Now that Doyle has been ruled out for Sunday's game against the Eagles, Ebron's fantasy upside gets a nice boost Week 3 and potentially beyond. Ebron caught three of four targets for 26 yards and a touchdown in Sunday's 21-9 win over Washington. Analysis: Ebron has opened his Colts tenure with touchdowns in back-to-back games, this time scoring from seven yards out on the opening drive. Fellow tight end Jack Doyle saw one more target that Ebron, but the former Detroit Lion finished with six more yards and is emerging as Indianapolis' player to own at the position thanks to his red-zone usage. Ebron caught four of five targets for 51 yards and a touchdown in Sunday's season-opening 34-23 loss to the Bengals. Analysis: Ebron and Jack Doyle were both heavily involved at the tight end position, as Doyle chipped in a team-high 60 receiving yards on seven catches. Detroit's much-maligned first-round pick in 2014 made a much better first impression on his new team, most notably on a 26-yard touchdown catch in the second quarter. Ebron caught all five of his targets for 54 yards and a touchdown during Saturday's 23-17 preseason win over the 49ers. Ebron caught all four of his targets for 16 yards in Monday night's 20-19 loss to the Ravens in the second preseason game. 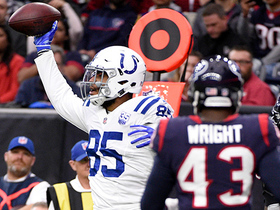 Analysis: Ebron split his receptions between starting quarterback Andrew Luck and backup Jacoby Brissett, catching two passes from both signal-callers. While fellow tight end Jack Doyle went for 32 yards on his two grabs, coach Frank Reich's offense leaves ample room for multiple players to make an impact at the position. Now, Ebron will just hope to find more room to run after the catch in Indianapolis' upcoming games. 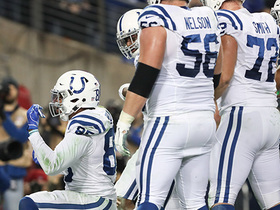 Ebron (ankle) returned to practice Friday, Andrew Walker of the Colts' official site reports. Analysis: Ebron had been sidelined the past few days with an ankle injury, but he's returning just in time to make an appearance Monday against the Ravens. Although Andrew Luck didn't look his way in the Colts' preseason opener, Ebron still has plenty of time to demonstrate a rapport with the quarterback. Still, Ebron will have to contend with Jack Doyle for reps, making the situation one to watch as the season draws closer. Ebron did not have a reception and was not targeted in Thursday's preseason win at Seattle. However, he did work with the first-team offense as the No. 2 tight end and has been heavily targeted in training camp according to Stephen Holder of The Indianapolis Star. Analysis: We wouldn't read too much into the first preseason game as Ebron is a veteran who was signed to a two-year, $13 million contract. His spot on the offense is likely secure and his role may not emerge until the regular season. He has upside with Andrew Luck healthy as he could emerge as one of the top few receiving options amid an inexperienced receiving corps. Ebron was moved out wide occasionally during Wednesday's OTA session, Zak Keefer of The Indianapolis Star reports. Analysis: Keefer suggested that Ebron's presence outside could become a consistent part of the offense in 2018. It wouldn't be too surprising given the above-average speed Ebron possesses, in addition to Jack Doyle's status as the team's top in-line tight end. Despite showing some promise at different points in his career, Ebron has yet to put it together completely. The Colts are hoping a change of scenery and a new coaching staff will help him unlock some of his considerable potential. 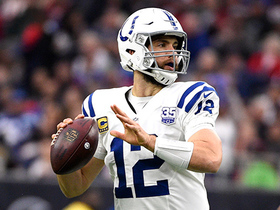 Ebron said Andrew Luck (shoulder) is the reason he signed with the Colts, as the tight end wanted to play with a quarterback who could get him the ball, Bob Kravitz of WTHR reports. The Colts and Ebron reached agreement on a two-year contract Monday, Adam Schefter of ESPN reports. Ebron completed a visit with the Panthers and is visiting the Colts on Monday, Ian Rapoport of NFL Network reports. Analysis: Released by the Lions last week, Ebron instantly became one of the top tight ends on the market, but his first two visits suggest he nonetheless may end up settling for a No. 2 role. He'd slot in behind Jack Doyle in Indianapolis or Greg Olsen in Carolina, though both teams are rather fond of two-TE formations, in part because they don't have much talent at wide receiver. The 2014 first-round pick will celebrate his 25th birthday in April. The Lions released Ebron on Wednesday, Adam Schefter of ESPN reports. Ebron has been told that the Lions are open to trading him, Dianna Russini of ESPN reports. Ebron was the subject of trade talks during the recently completed NFL Scouting Combine, Adam Schefter of ESPN reports. Lions general manager Bob Quinn said after the team's Week 17 win over the Packers that Ebron would be retained in 2018, Carlos Monarrez of the Detroit Free Press reports. Ebron brought in one of six targets for nine yards during Sunday's 35-11 victory over Green Bay. Ebron (knee) was a full practice participant Friday and doesn't have a designation on the final injury report for Sunday's game against the Packers. Ebron (knee) practiced in a limited capacity Wednesday. Analysis: Ebron missed five games between the 2015 and 2016 seasons due to a pair of knee injuries, but a limited showing Wednesday would seem to imply he's not in much danger of sitting out Week 17. That said, an absence would be a hit to the Lions' passing attack. Over the last nine games, he's put up at least 33 receiving yards on each occasion while reaching the end zone three times. As a result, his status should be watched closely as the weekend draws closer. Ebron caught five of eight targets for 83 yards and a touchdown during Sunday's 26-17 loss to the Bengals. Ebron caught five of seven passes for 33 yards and a touchdown during Saturday's 20-10 victory over Chicago. Ebron brought in 10 of 11 passes for 94 yards in Sunday's 24-21 win over the Buccaneers. He also lost a fumble. Ebron secured all four of his targets for 38 yards during Sunday's 44-20 loss to the Ravens. Analysis: Ebron's workload remained modest and his longest gain went for just 13 yards. Both Darren Fells and rookie Michael Roberts saw similar playing time, too. Per usual, there's little upside to found in this tight-end-by-committee approach the Lions are fond of. Ebron isn't a recommended fantasy options in Week 14 despite the appealing matchup against Tampa Bay. Ebron secured all four of his targets for 34 yards during Thursday's 30-23 loss to the Vikings. Ebron caught four of seven targets for 49 yards during Sunday's 27-24 victory over the Bears. Ebron caught two of three targets for 39 yards and a touchdown during Sunday's 38-24 victory over the Browns. Analysis: Ebron took advantage of the league's second-worst pass defense against tight ends (558 yards allowed to the position entering Week 10) to collect his second touchdown of the season. However, he's still only topped two receptions or 40 receiving yards in one game since Week 2 and continues to see modest usage in the offense while splitting reps with Darren Fells. Ebron will remain a touchdown-dependent fantasy option in Week 11 against the Bears. Ebron caught three passes on four targets for 35 yards during Monday's 30-17 victory over the Packers.